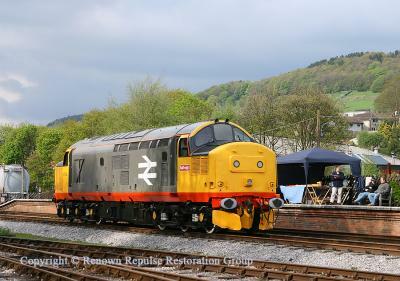 37152 and sales stand at Rowsley The Peak Rail diesel gala on the 8th and 9th May saw the RRRG sales stand out on both days, although for reasons unknown, possibly clashes with other events, the gala was fairly quiet and our stall was very very quiet. The team are seen relaxing between trains with 37152 looking on. The brief spell of sunshine was fairly unusual for the Saturday which was a generally poor weather day, and one at which the RRRG Gazebo was definitely required. 8th May 2010. The Peak Rail diesel gala on the 8th and 9th May saw the RRRG sales stand out on both days, although for reasons unknown, possibly clashes with other events, the gala was fairly quiet and our stall was very very quiet. 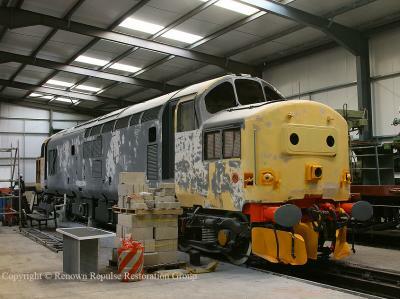 The team are seen relaxing between trains with 37152 looking on. The brief spell of sunshine was fairly unusual for the Saturday which was a generally poor weather day, and one at which the RRRG Gazebo was definitely required. 8th May 2010.